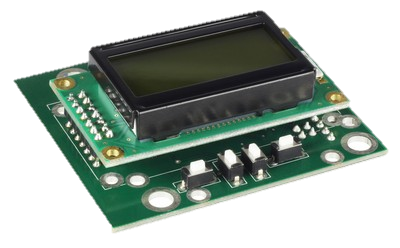 To create a custom stepper motor driver with onboard LCD screen and interface which could work flexibly in a range of peristaltic pumps. The motor controller needed to be operate in a range of modes – including dosing, running and analogue mode. Enable quick calibration and reliable dosing of a range of fluids. To run like a typical stepper motor driver in 1/256 microstepping mode. An easy to use interface enables the user to quickly and accurately run the pump. A major technical challenge or this project was the development of a 2 tier control interface in order to enable calibration and setup of the pump in a range of settings. The first tier serves as the main user interface allowing the user to run the pump and change basic settings such as speed, timing and acceleration. The second tier allows deep calibration settings to be adjusted enabling the user to run the pump for a fixed time, measure how much of a particular fluid has been dosed and then input this value. The controller will then automatically calibrate itself to dose fixed amounts of that particular liquid by determining the appropriate length of time to run at. At the heart of the Boxer iD driver project was a desire to create a stepper motor driver which would be able to work in a wide range of applications. By creating a driver which can work in a wide range of applications such as this it is possible to keep costs down as low as possible and also to offer a powerful range of options to customers. 1. Standard Run Mode – this setting operates by allowing the user to simply set the required speed and then run the controller. 2. Dosing Mode – in dosing mode the controller can be set up in a variety of ways including through quick calibration or more in depth calibration. The key point of this mode is to enable the user to select specific volumes that they want to dose. 3. External 0-5v – this mode allows the iD driver to become operated by external 0-5v controls.